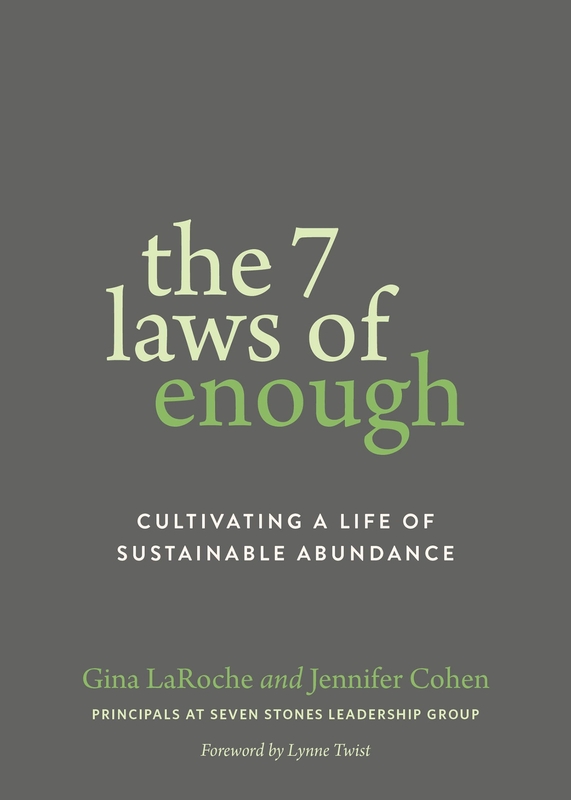 A shout-out today for my fellow Community Dharma Leader, Gina LaRoche, whose new book The 7 Laws of Enough: Cultivating a Life of Sustainable Abundance (co-authored with her business partner Jennifer Cohen) has just been released! “What if the truth is that everything is OK? Like, Garden of Eden OK? “You are enough. You do enough. You have enough, already. If you were to orient to life, to your team, your family, and society as if that were true, we guarantee you would see life in a whole new way. You would ask different questions and frame problems differently. New solutions would emerge…. “We call this bounty ‘sustainable abundance.’ Sustainable: ethical, reciprocal, just. Abundance: grateful, radiant, and present to the bounty everywhere…. “Law 1: Stories Matter. We are living in a web of stories, most of them not of our own making. We’ll help you go from being stuck in your inherited stories to being the author of stories that further your life’s purpose. “Law 2: I Am Enough. You are. I am. We are. When we stop questioning our birthright everything shifts. “Law 3: I Belong. Everyone does. No one has the right to tell us otherwise. We live in a culture that teaches us we’re separate and has a vested interest in making us feel as if we don’t belong. “Law 4: No One Is Exempt. We’re set free when we accept impermanence and face what is finite and infinite. This helps us see through the lies of scarcity. “Law 5: Resting Is Required. Society encourages us to be overworked, overmedicated, overfed, undernourished, and terrified. We crave the kind of deep rest we have almost lost. We can and must reclaim it. “Law 6: Joy Is Available. We can find deep and abiding joy when we see clearly, let go of the lies, and notice what we have already.